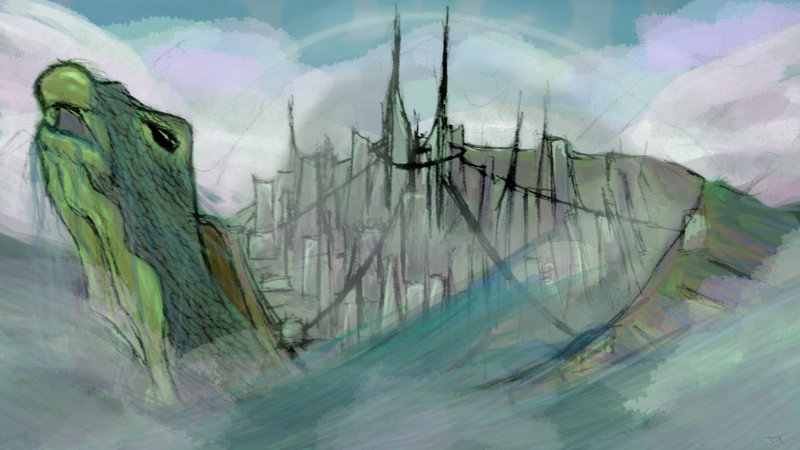 Rising from the depths of the sea is a city built on the back of a giant turtle. Random idea, thought it was cool. You may or may not agree. City itself isn't that great, but I had lots of fun with it overall. Been awhile since I've had so much fun painting. for 's Paradise City contest. Perhaps spending more time on it would make it a lot better but I like the idea of it. it looks weird but in a good way, I dont see it that much as a city but more as an ancient place in some ancient time, I like the random lines look and stuff.. but the things you put as clouds or I dont know...mist.. dont kind of hit on me..
OOooOo, very cool. Native American legends say that the world is on the back of a giant sea turtle swimming through space. This image evokes that cosmic energy while being whimsical. Very nice. maybe a bit of smudging on the water strokes would be nice, but it's great as it is now too. Somehow, it actually looks small ^_^'... maybe a place for Lilliputians ! But the turtle is really cool (great job on the scales), and i love the way you drew the water. I like how the city is tied to the back of the turtle (like it could go overboard and sink !). I really like the colors in the background; it seems to brighten the picture up a bit. Keeping the taller spires of the buildings supported by the ties appears to be a good idea to me. The idea totally belongs in a book/game. Beautifully applied paint, and a very dramatic scene. Great work! So yeah, I'm a huge fan of this. I can even see how the story would play out. "And I ascended further, my horrors were affirmed. Not only were we truly isolated, but we lived on a city that existed ontop a majestic sea creature. It was then, that I realized, I would never leave this city." Or something more awesome that would be named "City-Turtle's Day Out!". But this isn't about some crazy event, this is about a brilliantly composed idea realized. So yeah, as I told you before this piece kicks a whole lotta booty. I really like the fact that you took a concept that not every one would like and still went with it anyways, because it was fun. Ultimately, if you don't enjoy what your doing you might as well not be doing it (Unless it's work/school related). Hands down I'm loving the city. Probably the coolest part of it all was making part of the turtle shell into a metropolis. The nice thing is this city doesn't need a great deal of detail or depth, because we already know what it is. It doesn't need anything more than that. Another concept I'm really digging is the detail you gave to the turtle. While sticking with the style of the rest of the piece, you still gave the turtle texture and little details like water pouring out of it's mouth really helps sell this piece even further. While some can argue that more time should be spent refining it, I actually love the messy look you went for. You realized the turtle, city, sea and sky all very nicely and distinctly without making it over detailed. Especially since four years have passed since this piece was released and almost everything in the walling community is insanely detailed, this still holds up very nicely. So, I'm looking forward to reading the story you write based upon this scene, because it's going to be nothing short of epic.